Charitable giving is a cornerstone of FCS. Gifts from parents, staff, students, alumni families, grandparents, and friends of the school help our community grow over the last 31 years. Through philanthropy, our community invests in every aspect of the school. From teachers and curriculum to classrooms and outdoor spaces, it takes an active giving community to keep FCS strong and thriving. You can make a charitable donation to any of the school's funds by clicking the Donate Now button to the right. Robust Annual Giving gives the school flexibility to take advantage of additional opportunities as they arise. And, unlike tuition, charitable gifts to FCS are eligible for tax deduction. Endowment giving ensures that FCS is a vibrant learning community in the long term. Through the generosity of FCS donors to the Light the Way Endowment Campaign, FCS can attract and retain excellent faculty, fund financial aid and protect the School's economic diversity, and fund additional professional resources for faculty. Growing the endowment is essential for FCS' financial strength and stability. If you are interested in learning more about supporting FCS through an Endowment or other major gift, please contact Christine Dunathan at 301-441-2100. The Blackburn Financial Aid Fund was established by Thomas and Olive Blackburn, one of the "founding families" of FCS. This key fund receives significant support from the Spring Auction, Adelphi Friends Meeting, and FCS families and other individual donors. More than 40% of FCS students receive financial aid, with substantial support through the Blackburn Fund. Discover ways to support the long term strength of FCS while meeting your family's financial needs now and in the future. You don't have to be wealthy to make a meaningful gift that helps the school grow and thrive! Thoughtful gift planning helps secure your own financial future, reduces your tax burden, and benefits the school. There are many options for giving a planned gift, including some with immediate and ongoing benefits during your lifetime. FCS can work with your financial or legal advisor to complete a gift to the school. Contact Christine Dunathan, Director of Advancement, at 301-441-2100 for more information about planned giving. Established by June and Harold B. Confer, two of FCS’s founders, this fund honors Harold S. Confer, Sr. as well Harold B. Confer, Jr, who passed away in September 2014. The Confer Fund supports the music and art education at FCS, providing instruments and art equipment, and funding for visiting artists and performers. In accordance with the wishes of the Confers, one-half of each donation to this fund is to be spent in the year it is received, and one-half directed to long term investment in the Confer Music and Art Endowment. Environmental education is supported by this fund, created in honor of Elizabeth Hole, longtime teacher and inspiration for green initiatives at FCS. Broad support of the Playground Fund made the FCS playground possible. Gifts to this fund help with playground maintenance and expansion. In addition to outright gifts, FCS community members may purchase an inscribed brick, paver, or community square to be placed in the path through the FCS Peace Garden in the center circle. Consider joining with family, friends, or classmates to commemorate a person, an event, or share a thought or feeling. The bricks are locally made. Contact the Advancement office for an order form. Thanks to our entire school community, FCS opened the 2013-14 school year with new facilities, including a new science lab and art studio, new middle school classroom space and lockers, and a new performing arts stage. The Green and Growing Campaign for FCS raised the full cost of the project--over $1.4 million--through charitable giving by every part of our community. Convenient, secure online gifts may be made by clicking on the Donate Now button at the top right of the page. If you would like to pay by check, please make it payable to Friends Community School, with the fund to which you are giving written on the memo line, and mail it to FCS at the address below. You may also give by using an FCS donation envelope, mailed in late Fall and always available in the school foyer. Telephone donations are also possible. Please call Christine Dunathan at 301-441-2100 for a donation envelope or to make a gift by telephone. A gift through a direct transfer of part of your minimum IRA distribution may reduce your income tax. Gifts of appreciated securities may also offer you significant tax savings. FCS’s Schwab brokerage account number is #1036-0794. Our DTC number is #0164. Please contact Christine Dunathan at 301-441-2100 for details and to let us know to expect your transaction. Thank you! Pledges allow donors to plan their giving over time. Often, pledges give you as the donor a way to make a larger donation than if your gift were paid today. You may make a pledge to be paid either in the future via a lump sum or in installments, within a single year or over several years. The online giving form makes giving or pledging simple using a credit or debit card. 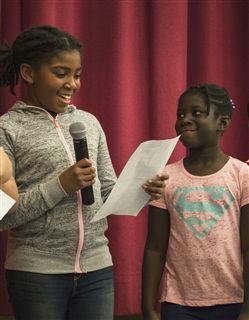 You may also download a paper pledge form, or contact Christine Dunathan at 301-441-2100 or christine@friendscommunityschool.org to pledge your support. Many companies offer a matching gift program that matches or even triples the value of your gift. Please contact your Human Resources Office to see if your company offers such a program. For questions or assistance with any paperwork, please contact Christine Dunathan at 301-441-2100. Planned giving benefits the school and can also provide you or your estate with significant tax and/or income benefits. FCS offers a number of planned giving options, including charitable gift annuities, charitable trusts, and bequests of cash, securities, insurance, and other assets. FCS’s Schwab brokerage account number is #1036-0794. Our DTC number is #0164. Please contact Christine Dunathan at 301-441-2100 to let us know your gift is coming, or to learn more about the planned giving options available. FCS is a 501(c)(3) non-profit organization. Gifts to the school are fully eligible for tax deduction.